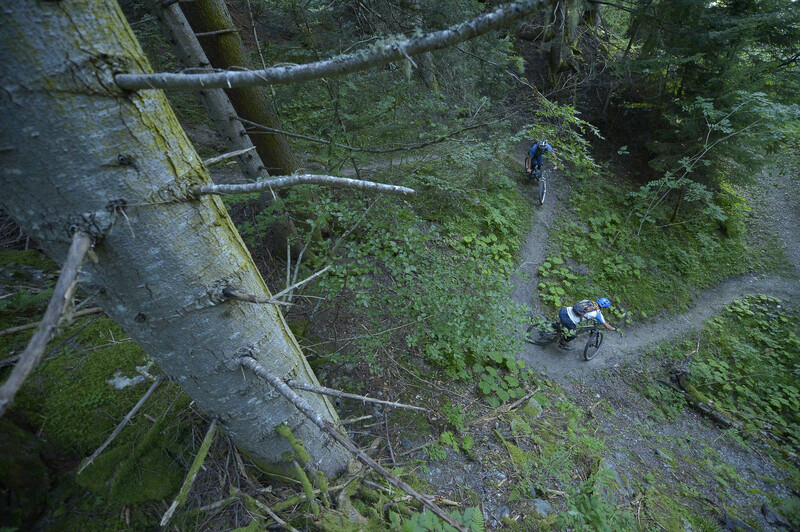 Epic Singletrack Descents are what make us tick here at trailAddiction. It‘s the very reason we kept coming back to Les Arcs to ride our mountain bikes during our early trail-scouting days way back in 1999. This same hunger for fresh, pristine trails drove us to create our second HQ at Destination X in more recent years. The combination of epic-scale, adrenaline-inducing, naturally flowing downhill singletrack with the occasional pause to take in the next piece of breathtaking scenery also makes this type of riding a winner with our guests. If this is your idea of ‘proper mountain biking’ then we are reading you loud and clear! 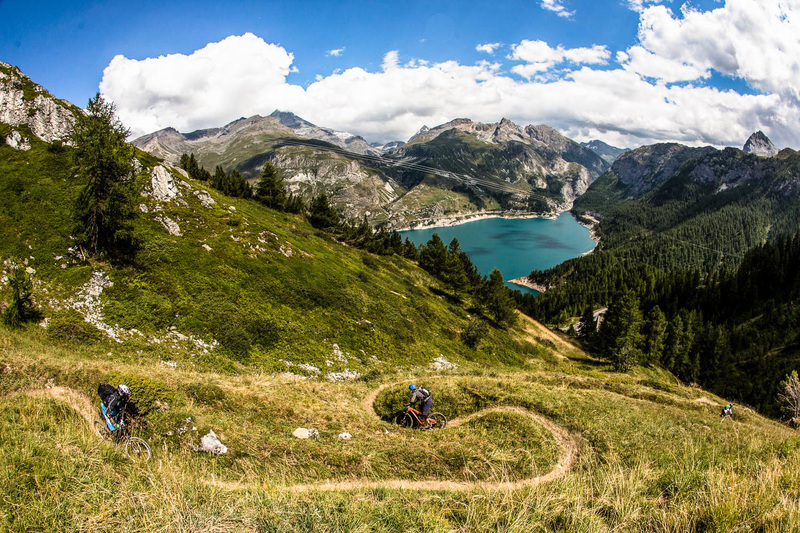 In our extensive experience, there is simply nowhere better to ride on this planet than the 1000s of Km of trails that are hidden in this part of the Alps. 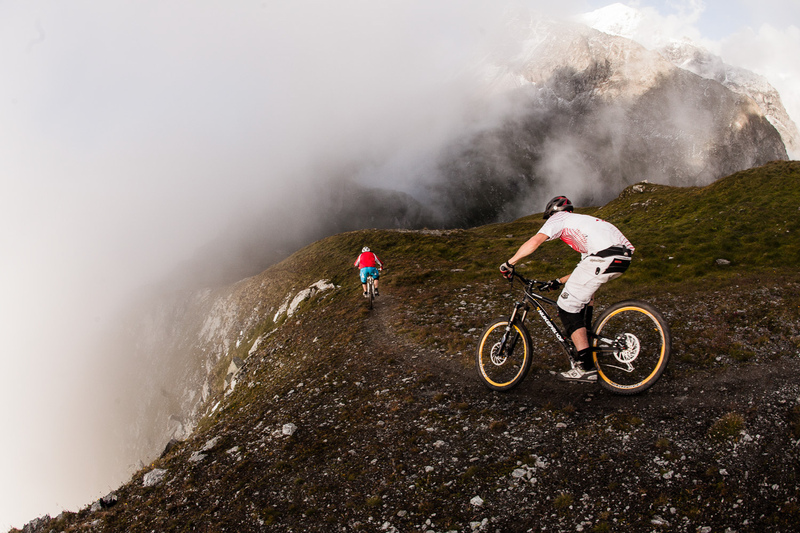 In recent times, most people are now calling this style of riding as “All-Mountain” or “Enduro”. We just call it superb mountain biking, and we’ve been doing it out in the Alps since fully-rigid bikes with v-brakes were the cutting edge. Fortunately for us, the hardware we ride has caught up a lot in recent years, which simply means we’re able to ride further & faster, and with an even bigger grin on our faces. To access these trail adventures, we make use of efficient local lift systems which take us and our bikes swiftly up to as high as 2700m. Once at the top, your only difficulty is deciding with your host which route you fancy descending next. Luckily, whichever you choose, within a few hours of setting off you’ll have bagged as much sweet singletrack as you would in a good month back home. Reach the heat of the valley floor (that’s sometimes 2000 vertical metres below the start point), pause for a drink and then hop back on the lift towards the top again for more of the same… but maybe this time rail that natural berm into the woods a bit harder, or perhaps this time turn right instead of left by the waterfall…. there are literally hundreds of kilometres of trails to discover. The possibilities are endless. Aside from all the natural trails accessible from directly with the lift systems, there ’s also a load of stuff that isn’t so easily reachable by lift. To access these backcountry trails which many people consider to contain very best singletrack in the region due to their extra ‘hidden-ness’, we use a minibus and trailer ascending farm lanes and logging roads to get to the top. We’ll often thown in a train or public coach journey at the end of the day to get us back to base if we have ventured particularly far afield. The immensely varied and sometimes challenging terrain encountered (e.g. root and rock combinations, a handful of faster sections or the occasional stream crossing) is also sure to keep the mind focussed until the very last pull on the brakes and that hard-earned cool beer on the terrace in the evening sunshine.